It is the lion's turn to take the attention and spotlight in this portiere or long and narrow tapestry "Portiere Du Lion" used in medieval periods to adorn homes and palaces. A detail from the Lady and Unicorn series of tapestries, we see the ever present lion which seems to protect the lady in the series of works portraying the sense as well as love. The mille fleur background is a fantasy like background decoration using motifs from nature such as flowers, leaves and creatures of the forest such as the bunny rabbit. 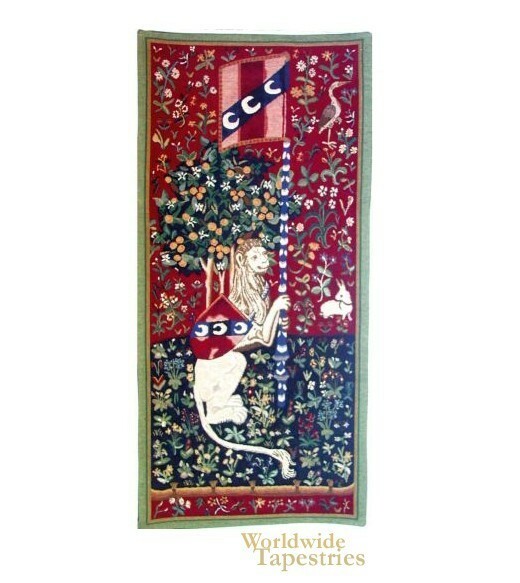 This unicorn art tapestry "Portiere Du Lion" is backed with lining and tunnel for easy hanging. Dimensions: W 21" x H 46"